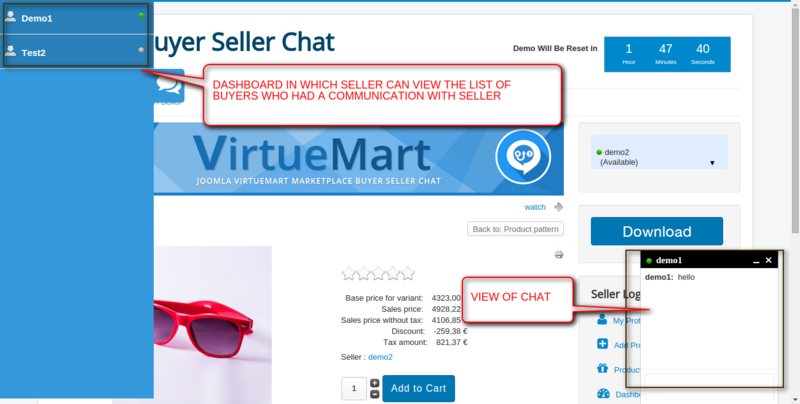 Virtuemart Marketplace buyer seller chat extension is very useful extension for Joomla multi vendor Marketplace , by which buyer can communicate with seller and visa versa. Buyer List for seller dashboard . Online, offline, Busy and idle status for seller and buyer . Sound effect during chat success. Smiley support for interactive conversation . Joomla Virtuemart MarketPlace Seller Buyer Chat (Module+Component) is working in the Joomla version. When you’ll download the Joomla Virtuemart MarketPlace Seller buyer Chat extension you’ll get one zip file, unzip and use it. Contact us http://webkul.com/ticket if you have any trouble in downloading the extension. Step2:- Select username or name by here which is display on Chat box header as a chat box title. Buyer can manage the login status. If seller is online then Buyer can chat to seller.